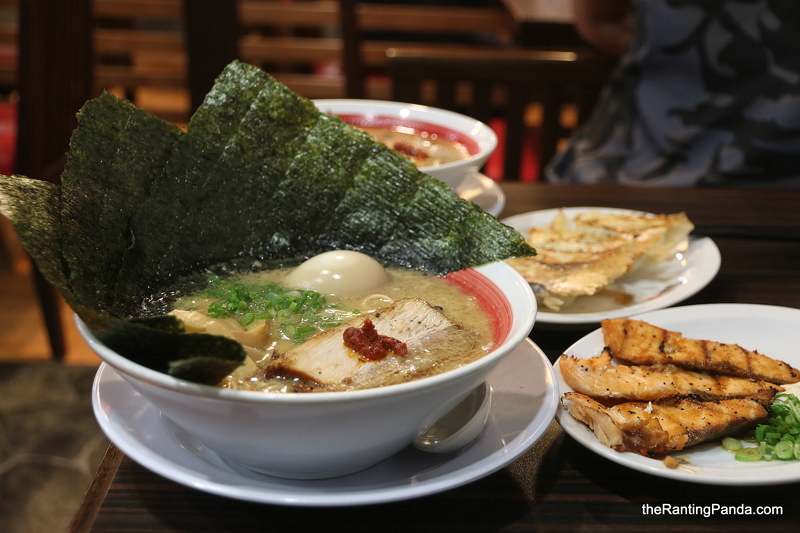 The Place We have always been curious about Ramen Bari Uma, especially after walking past the shop at Tanglin Shoping Centre umpteen times. The ramen brand is in fact from Hiroshima, Japan, and has various overseas outlets in Malaysia and Indonesia as well. We finally checked out the shop at Tanglin Shoping Centre, which spots a casual setting and a larger space than it seems from the outside. There is an open kitchen at the end where you can watch the chefs prepare the ramen in full action. The setting of Ramen Bari Uma feels dated like the mall, but I guess that is part of the charm of the place. The Food We went straight for the tonkotsu broth ramen instantly as this is the specialty broth of Ramen Bari Uma. The Ajitama-Uma (S$14.90) comes with an onsen egg and slices of Char Siew meat, and if you wish to add seafood, that will be an additional S$2. The broth we had was thick, though not quite rich enough for our expectations; although we got to admit the soup did smell absolutely enticing before we started digging in. The noodle texture is on the firm end, which may not suit everyone’s taste bud. Would believe the restaurant will allow diners to choose their preferred texture of the noodles, not that we can recall this with certainty. As for the char siew, we were split on this, with myself finding it a tad too tough to much disappointment and the Rantee enjoying the meats. And yes, the ramen here comes with a dash of chilli paste, so make sure you let the kitchen know if this is not something you want in your ramen. On to the sides, our advice is don’t even bother with the salmon. The Aburi Salmon (S$9.90) looks nothing like the tantalising picture on the menu. The salmon was bland, and it neither look nor taste like it was aburi-ed. Way too dry, and we wondered what justified the price tag of this side. Despite the decent start on the ramen, this was a true letdown. We also had the 5-pieces Gyoza (S$6.90), which was definitely the star here. We enjoyed the crisp texture, together with the juicy meat fillings, we highly recommend diners to get one of this to go with their ramen. Rants We sat at a corner of the restaurant and thought that the ventilation was bad. It could be due to the open kitchen, so we will recommend seats further from the kitchen if you have low threshold for heat like us. Will I Return Again? Overall, Ramen Bari Uma is a decent option to satisfy your ramen fix if you are in the vicinity. However, we doubt we will make a trip just to have it as we have had better ones in Singapore – the aburi salmon sealed the decision on this.